USA Today has a great article on the evolution of education and the impact of Google on what we deem as important issues to memorize. I believe this is a must read for all educators as we grapple with curriculum changes in light of information that can often be more readily accessed through Google than remembered. Again, we must ask ourselves, what is important for students to know? The Savvy Technologist lists an update on his podcave (His flickr picture is shown to the right.) He writes about his new gadgets for where he creates his podcast. He didn't list prices, so I've done a little research for those interested in a more professional setup. The Heil 3 boom is $89 - I don't list the link b/c the advertising is a little risque for my linking interests. These just seem to be the new microphone items, I do not know about the other items in his "podcave." For now, I think I'll have to stick with my $6 Wal-Mart microphone and free audacity software. It's the holidays, I can dream. To blog or not to blog -- Find the time! It is important! 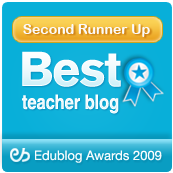 Ewan McIntosh from Scotland has a great article on why it is essential for educators to blog and to read blogs. I agree with him totally. We as educators cannot rely solely on what we learned in college. Many experienced educators say that they have practical knowledge on what works. What if you can combine practical knowledge with current research? Talk about a Lethal Weapon! By subscribing to the best educational minds and participating in online discussions, you simulate much the same environment as a college classroom. But this is so much more than a college classroom! This is the world classroom! Join in! I never would have read an educator from Scotland's writings much less learned from him. Now I'm reading a fellow from overseas and finding myself inspired! 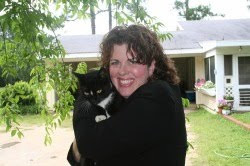 I challenge educators everywhere -- while on break -- set up a bloglines account and subscribe to some blogs. You can see what I'm reading by going to http://www.bloglines.com/blog/coolcatteacher. If you want help, just e-mail me and I'll invite you to bloglines and include a list of my blogs. There is a cool article I found at Teach42 about this. Once you're set up it is easy. This is one way to aid your resolution to be a better teacher -- spend just 10 minutes a day reading current educational information on your blogline account. Writely.com - Student answer to writing papers? There are so many new web aps that I have on my list to try over the break, that I doubt I will get them all. The converters in Word don't work very well for Works and Word Perfect. This is a great solution for these students! They can log onto writely.com and create an account. They can then create and edit documents. 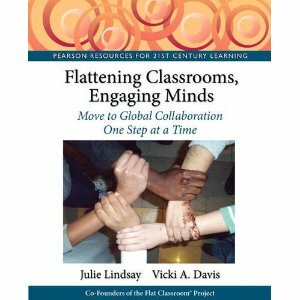 They can even collaborate with other students if it is a group project. The difference here between this and a wikipage is that writely is a word processor. This program will import and export into Word format! Until the produce the final word document, they can edit from any computer where they can log onto writely.com. This is a great advantage for students and provides them with portability. Another great feature is the ability to directly produce Adobe PDF files from writely -- something you cannot do with Word. So much for lugging a laptop or even those bothersome floppy disks that always give out. Go to the library, do your research. Copy your source. Login to writely and add your changes and be done. Very impressive! Let me know your favorite web apps. This has got to be killing the folks at Microsoft. USA Today - Great article that explains what all of this is about! "Our Tools are Changing — Technology is changing at dizzying rates, which is part of the reason for the preceding elements of change, but also a good reason why we should be focused on the information and not the technology. We can’t keep up with making the technology the curriculum. All we can do is prepare our students to teach themselves. It’s the only way to keep up. " One of the primary strategies that I use in my classroom is that of what I call the student-teaching method. If we are in Microsoft Word, I assign the lessons to groups. Each group's job is to work ahead and do the lesson and I grade their work. They then are responsible for presenting and instructing the class (I fill in the gaps, make points, etc.) assist the class in the work (along with me as part of their team) and pre-grade the work -- giving the work back to the student if they haven't mastered the skill and helping them master the skill before it goes to me. I explain it to my students this way -- "the technology I teach you will be outdated in two years but if I can teach you to be unafraid of the technology, learn the technology with the tools at hand, and teach others -- I have taught you a skill that will prevent you from being obsolete for the rest of your life." For, I could take the easy way -- I could hold their hand -- spell out the curriculum 1.2.3. click steps and when a new software package comes out - they are lost. Or, I can teach them how to learn. I can teach them the structure of application software. I can involve them in the teaching process. That is when they learn. Some teachers do not like this method. They think it gives up some of their credibility as the sole information giver. I want to do what works best. This strategy takes a little longer. It takes training. But once you get rolling -- you are really going! The teacher is still essential in filling in gaps, keeping the class on track, and ensuring mastery. However, I agree with Dave that we often are so focused on the technology that we forget to teach them how to teach themselves. That is what the goal of my classroom is and always has been. To enable students as self- and peer-teachers. That is where true synergy and technology empowerment come from. Some schools have adapted this and no longer teach technology -- big mistake! One must be immersed in it and it must be demystified. When it is done so properly, you have transformed the student into an active self-motivated learner. Teach students to teach themselves -- the core of the technology classroom! Westwood Named Wikispace of the Month! I'm excited about my school wikispace being named wikispace of the month. Here is the blurb from their e-mail. They will be posting the article to their website this week. The students are also thrilled. Westwood is the Wikispaces Space of the Month for December 2005. Fundamentals, Keyboarding, and Computer Graphic Design. Of particular interest is the 10th grade "study hall"
study for exams! They update this on their own! It has its own life! added material and can control who contributes to each space. Our Community: The students and faculty of Westwood Schools. and high school teachers up to speed. that wikispaces is the thing that will integrate all of these technologies into meaningful experiences. I was talking to the mother of two of my better students. She told me how much it means that I am showing them useful, meaningful technology. They spent all last weekend making wikispaces for their year thus far in English. "Mom, I'm not doing this for Mrs. Vicki, I'm doing this for me - - I need to have my material together so that I can review for the AP English exam my senior year so I am going to put all of my material on the wikispace. Everyone else can edit and improve it and it just becomes better - this is the way I am going to succeed." With the John Seingthaler Wikipedia scandal, we must again remember to teach our students that the Internet is quite different from the papers they write in the classroom. If they write unsubstantiated information in a paper - they may or may not get an F. If they write inaccurate information online - they may lose their job, or their credibility. I talked with my eighth grade students today about Myspace. Three quarters of them have an account -- none of them realized all of their information was viewable to everyone out there. I discussed how they have put their information on the "public domain." They didn't even know what that was. I think that the laws we have to protect children must extend that to the Internet. We would not let our children stand on a busy street corner talking to strangers -- but we are letting them share their information with the world. I wonder how many parents have read their children's myspace. Today one school superintendant sent home letters to parents urging them to have their children remove private information from myspace. Children can post photographs and other items on both flickr and myspace. The scary thing is, there is new technology out there that will allow a search engine of sorts to match photographs. A predator could scan in a photo of a child they have spotted and feasibly in a couple of years, using this technology, they could match with the child's myspace account -- see what parties they have been invited to and what they are chatting about. It is a whole new world out there. Legislators are very slow at understanding and responding to new technology and rarely act to protect children until several terrible cases happen. I do not want my students to be the case discussed in Congress with their name on a bill. Introduce case studies in my computer science class to discuss pro con of various legislation that could be in. Let's face it -- a 60 year old Congressman is not going to be educated about these issues -- their children are older and many have stopped learning about new technology. It is our job to educate the legislators of tomorrow. I feel we have a predator-sphere where the predators are getting the upper hand and children are becoming easy targets. Wake up! Many states such as Maryland are waking up to this fact. I think we need more proactive education of students. What do you think? I have been learning about the various tools to get the load off of me as webmaster of our school website. Recently, I attended a class on Macromedia Contribute and I was impressed. However, I dreaded the installation, training, and other work that always comes with software. RSS Calendar - www.rsscalendar.com -- The front office staff, always looking for ways to improve things, updates the calendar. We used categories so that news feed readers can subscribe to just the calendars they need. Check out our website at www.westwoodschools.org -- the calendar on the right and on the calendar pages comes directly from the online calendar. And when I say fast - I mean fast -- it updates immediately! That is two hours off my plate a week! Flickr - www.flickr.com -- I am using this to add photos to the website and have the parents share the photos. I have a photo wizard in photoshop I have been using -- however the process took me about 30 minutes per album after I ran the wizard, checked the code and uploaded the photos. Now-- right click on the photo, upload to flickr - add a few tags and Kwam! Photos on the website! I created a banner using their wizard for the left of the homepage and a flash button for the left side of all of my templates. Easy! Blogger - www.blogger.com -- I've created a blog just for news and have invited our major "newsmaker" teachers on campus to post. Using feedburner (see next) it automatically feeds into the home page and to my news page on the website. The great thing about this is the Archive. Blogger keeps the information there indefinitely so people looking for an old article can search it! It is an easy to use interface! No more mailing articles, copying, formatting it for my style sheet -- pain after pain! Another 30-45 minutes per week. I'd love to hear from anyone who has other great tools out there to make things simple! I'm not sure what I'll do with all that "time" but then again -- I'm a computer science teacher/ web master/ tech support guru-- there is no such thing as time -- maybe I'll get around to inventing a way to make a Pentium II go faster-- hmmmm. Well, I'm quite impressed. My sophomores are still updating their study hall page at http://studyhall.wikispaces.com/ and we're into day 4 with no requests nor grades from me. They have also worked to create study notes for their biology test which they have linked to at http://studyhall.wikispaces.com/biology+notes+1-8. This is the amazing thing I am noticing - these students really are collaborating! It is not just one student doing the updating. They are taking turns and working together! Students who are weaker in the organizational skills are saying that this is a lifesaver! The other interesting thing happening is that students are inviting and training other students not in my computer science class. It will be interesting to see if there is a reflection in the class grades overall. I have taught web design for four years but I have never seen a space evolve as quickly as these wikispaces. It is a great concept worth exploring more! Impressive so far! Very easy! Podcasting - Synthesize and summarize! I was listening to Mike Hetherington from Connecticut and his 6th grade podcast today. I am struck with the particular usefulness of podcasts for helping students synthesize and summarize information as well as engaging and providing review materials for auditory learners. If you want to know how to podcast, just review my simple steps for podcasting. I put this up for my students who wanted to do it for free from home. Students can be assigned a section of material and asked to write a 2 - 3 minute script. They should create a wiki page to summarize information (see yesterday's article) and then record their podcast. They will then upload and link the podcast to their review page for other students to listen to as they are reviewing the material. Thus, at the completion of a year, students have created a synthesis of textbook material in a language that is relevant to them. It is available in written and auditory form! Students have become part of the process and producers rather than just consumers. Room 208 - from Maine - Mr. Sprankle has mastered the art -- you must see what he's done! Downs Primary School - I love this podcast from England -- they are only on their 7th but they are a great resource to listen to. They've been doing it a while! I'm very impressed! Regardless of the quality, students are engaged and excited about this new medium. Also with technologies now available such as audioblogger -- students can actually create audio blogs (a/k/a podcasts) from their cellphones and post them directly to the Internet. With most every student having a cell phone or access to one these days -- what a great assignment. I'm going to look into building that into my podcasting plan in January. With all of this said, I do not worship new technology for new technology's sake! If new technology has evolved to the point where it is a new communication medium -- it becomes a tool for communicating the information that we are teaching students. It is about the content of what we're trying to teach-- not the communication method! Every lesson must have an objective and be in line with curriculum objectives. Each year I incorporate more technological tools and communication methods into my curriculum and each year I cover more material -- not less! Each year I become a better teacher! May I never be unwilling to change. I've been using computers since I was 8 (if the TRS-80 with 4KB of RAM counts as a computer!) I remember that when I was learning to write adventure games in Basic, students made fun of me and teachers didn't care -- but my parents encouraged me to do that because I loved it! We do not have to understand how a technology works to use it! If it increases students ability to learn and retain information it becomes a tool for educators who care about teaching. Teaching is my passion! When the light bulb goes on and a student truly "gets it" -- I am alive and realize I am living a piece of myself that will live on far past me. If you miss that light bulb experience -- adopt (with a plan) some of these new technologies as they are appropriate along with the best of what you already do! Paper and pen have their place, memorization has its place, books have their place, make room for the computer! Podcast now with my easy steps to podcasting. 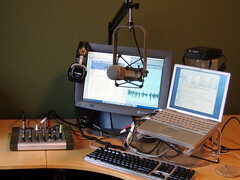 The term podcasting is a combination of ÂiPodÂ and ÂbroadcastÂ and describes type of syndicated digital audio that results in automatically downloadable files which are playable in portable media devices, such as (but not limited to) the iPod. Australian universities have been making lectures available as streaming audio for some years now, but with learners anchored to a computer in order to listen. Podcasting has allowed students to take lectures and other audio wherever they go, but this model still relies on the top-down structure of lectures as academic content for studentÂs to consume. However, in the University of Western AustraliaÂs Communication Studies honours course ÂiGeneration: Digital Communication and Participatory CultureÂ the tables have been turned somewhat and now students are making podcasts, too. For their major assignments, students were asked to create an innovative audio podcast which engaged with the notion of participatory culture and the results ranged from a Âpod playÂ in the style 1930s RKO radio theatre to an alternative commentary for a Simpsons episode focusing on consumer culture and intertextuality. These podcasts are also cultural output themselves Â they will remain downloadable indefinitely, allowing students to use them in future online portfolios and also providing a resource (or entertainment) for others. Moreover, the same system which supports lectures in streaming and podcast form, the iLecture system, also facilitates the studentsÂ podcasts, in effect allowing them to take a turn at using the digital podium. With students podcasting, teaching and learning is clearly a two-way street. In this paper, I will outline the way in which podcasting was used in the iGeneration course; the setup in terms of technology and philosophy driving it; the podcasts themselves; studentsÂ responses to podcasting (both informally and from a short survey); and the initial lessons learnt from student podcasting at a tertiary level. I have got to have a place on the net to express what some may consider revolutionary teaching ideas. For my first blog on this topic, I want to write about my amazing impressions of what I will call "wiki wiki teaching." "Wiki wiki" means "quickly" in Hawaiian. I came back from the GAETC conference and had attended three amazing sessions with David Warlick. I had devoured his book, his website, and had begun to implement his recommendations. I was excited, but not yet floored. I asked them to post meaningful, relevant information on their topic. I asked them to summarize information they found on the Net and to link to it. I asked them to continue to read their topic and ask themselves -- "What do I not understand about this topic?" and then to proceed to answer that question and post their findings. I asked them to use some of the websites that they read about. On the third day, I gave each team 5 minutes to present their topic -- they had to summarize and demonstrate the use of their term in action. I must say, I was very impressed with the presentations and the grasp of knowledge the students had. They understood the concept of Web 2.0 and their topics with a knowledge base that was astounding. But the true surprise came the next day. They created a place to post projects and assignments and invited each other to their wikispace. Then, they created links to the websites that their fellow students had created to help them study/ review/ complete the project. They are used to copying notes for one another -- but now they can collaborate on notes! The results are astonishing! I lie exhausted on the couch at the end of this week. Wiki Wiki Teaching is an understatement. I feel fulfilled. I feel excited. I feel that I've unknowingly introduced students to their future. I feel that the material has become relevant in a way that has not been done before. I changed my semester assessment to a wiki project. Other teachers are planning assessments next semester to include wiki portfolios. It has been one week! It went by wiki wiki! I'll tell you later about our bloglines experience, how we've used RSS to improve our school website and save me 2 hours a week, and many more items!